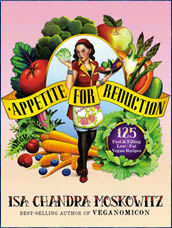 Appetite for Reduction is a low fat vegan cookbook written by bestselling author and vegan chef Isa Chandra Moskowitz. She says the recipes in the vegan cookbook were created after she was diagnosed with PCOS and realized she needed to change her diet. Those health-promoting changes included reducing her intake of fat and emphasizing more whole food based meals. Moskowitz asserts that healthy cooking doesn’t have to mean deprivation and the 125 vegan recipes included in the book are designed to taste great and trim the waistline. They were also created with the busy weeknight chef in mind, with most of the recipes ready in under 30 minutes. All of the recipes in this cookbook are vegan, low in fat and high in fiber. Whole foods form the basis of the recipes so foods such as vegetables, fruits, whole grains and legumes are emphasized. Each recipe contains 200 to 400 calories per serving but because the meals are high in fiber and volume the portion sizes are satisfying. The vegan recipes include nutritional information, which makes it easy for meal planning if you are keeping track of your caloric intake. Many of the vegan recipes take less than thirty minutes to prepare and the ones that don’t will give you plenty of downtime so that you can be involved in other tasks while your meal is cooking. There are also options for dieters with food allergies and intolerances to foods such as wheat, gluten and soy. Fruit, vegetables, chickpeas, black beans, lentils, edamame, tofu, tempeh, quinoa, cous cous, pasta, noodles, polenta, brown rice, almonds, peanuts, avocado, sunflower sprouts, toasted sesame oil, soy sauce, balsamic vinegar, mustard, agave syrup, herbs and spices. This is a low fat vegan cookbook so it does not include exercise recommendations. Appetite for Reduction retails at $19.95. Click Here to purchase the cookbook at a discounted price. Encourages the intake of fresh and unprocessed foods. Will appeal to vegetarian dieters. A low fat vegan diet may reduce the risk of cardiovascular disease, diabetes and cancer. Includes recipes free of gluten, soy and dairy products. Provides education about nutrition for vegetarians. Portion sizes are satisfying while being low in calories. Eating a vegan diet can reduce environmental impact and animal suffering. Will not appeal to those who prefer not to eat a vegan diet. Requires a fair amount of time to be spent in the kitchen. Does not contain many vegan recipes suitable for breakfast. No vegan dessert recipes are included in the book. No recommendations are given for snacks. Appetite for Reduction is a low fat vegan cookbook and it will appeal to vegetarians or those interested in eating a plant-based diet. By enjoying the recipes in this cookbook you will naturally reduce your intake of fat and calories, which should result in relatively easy weight loss for the majority of dieters.